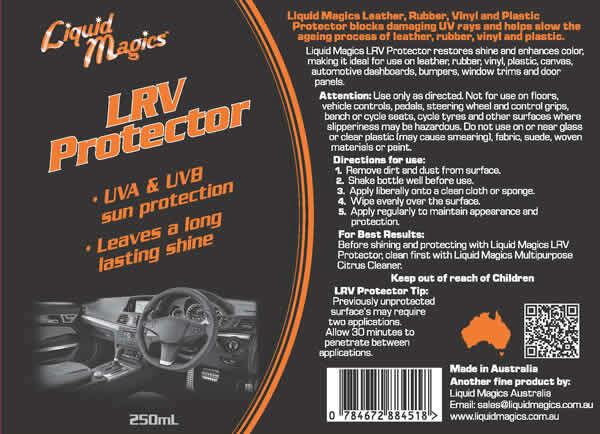 Liquid Magics LRV Protector shines, protects, restores and enhances colour, making it ideal for use on Leather, Rubber, Vinyl, Plastic, Chrome, Canvas, Automotive Dashboards, Bumpers, Window Trims, Door Panels, Trucks, Caravans, Boats, Bikes etc. Liquid Magics LRV Protector is the easy way to clean, protect and shine Leather, Rubber, Vinyl, Plastic, Chrome and Canvas. Liquid Magics LRV Protector blocks damaging UV rays and helps slow the ageing process of leather, rubber, vinyl, plastic chrome and canvas. 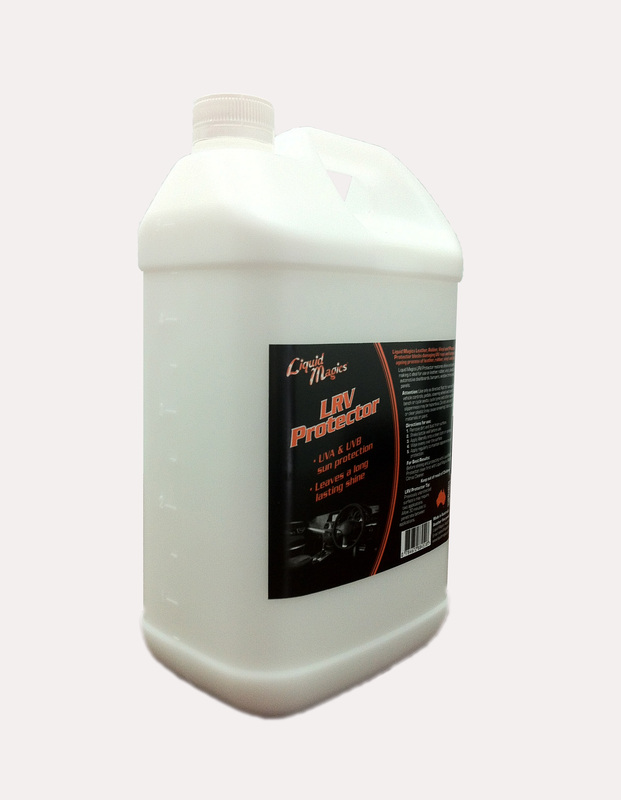 Liquid Magics LRV Protector restores shine and enhances colour, making it ideal for use on leather, rubber, vinyl, plastic, chrome, canvas, automotive dashboards, bumpers, window trims, door panels, trucks, caravans, boats, bikes etc. Attention: Use only as directed. Not for use on floors, vehicle controls, pedals, steering wheel and control grips, bench or cycle seats, cycle tyres and other surfaces where slipperiness may be hazardous. Do not use on fabric, suede, woven materials or paint. Spray onto the surface and wipe with a clean cloth. Apply regularly to maintain appearance and protection. For Best Results: Before applying Liquid Magics LRV Protector, clean first with Liquid Magics Multipurpose Citrus Cleaner. Liquid Magics LRV Protector Tip: Previously unprotected surface’s may require two applications. Allow 30 minutes to penetrate between applications.